We've just got home from a month's holiday in Canada and clearly quite a lot has been going on while we've been away. The Top o' the Morning pub is no more and I expect the site will be used for a housing development so maybe this is the beginning of the gentrification on this side of the Hertford Union Canal. Then I walked along the canal for a short distance and I spotted a planning development notice taped to a lamp post. 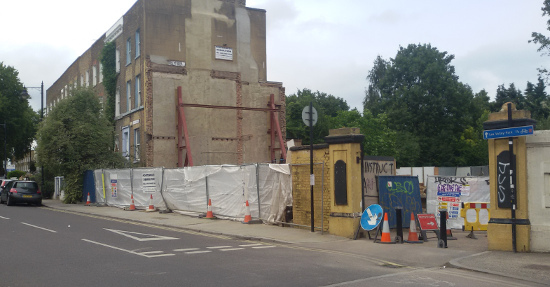 As far as I could tell it concerned an existing property and not the former pub. I continued on my way and almost immediately bumped into my 'friend' the motor mechanic who was walking his boss's dog in his lunch hour. I took the opportunity to say goodbye because I had decided this would be my last sketch of this series of drawings. He told me that the business he works for will be moving out by the end of the year. He wished me good luck and we parted company. 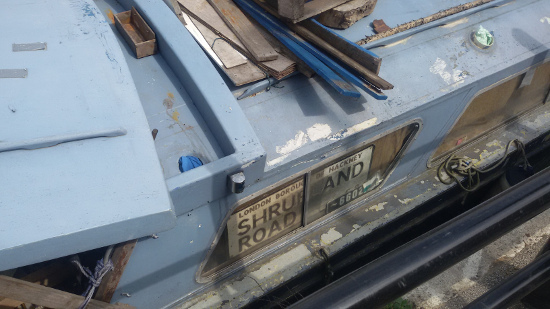 Life on the canal is always changing and at the same time seems changeless. The boats continue making their way through the locks and passers-by stand and stare. Runners keep on running and dog walkers keep on yelling at their canine companions. 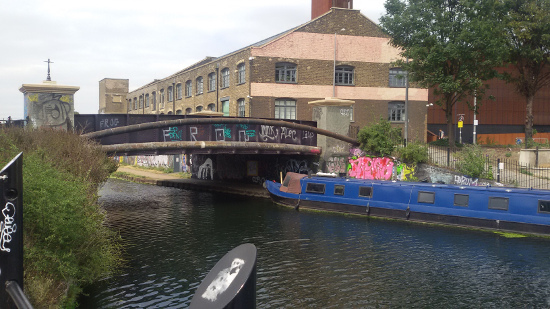 I've relished recording my responses in the form of sketches, over the spring and summer, to this short length of canal that will probably change out of all recognition over the next few years. I've enjoyed experimenting with my drawing and have been happy to publish the successes and the failures along the way. But now there is a hint of autumn in the air it is time to bring this project to a close. When I began this composition I imagined that I would only use pencil to start with and then I would finish it in pen and ink. Part of the way through this process I realised that it needed to be completed in pencil. 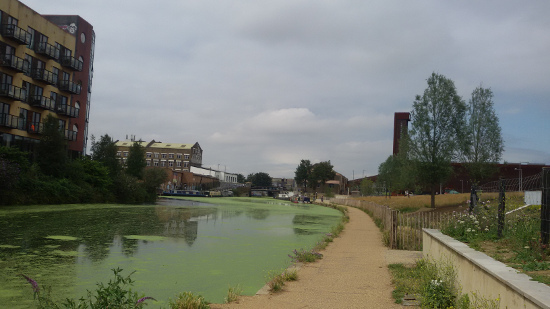 From this view you can see the River Lee Navigation ahead and the Hertford Union Canal just on the right hand side. Although this is the end of the series of drawings it is not the end of the project or the blog and I will be posting developments in the next couple of weeks so please check back later. Is this the final drawing? I had been settled into my pen and ink drawing for some time when my view was interrupted by a small film crew. They walked passed me and were pondering where to film, having exchanged views about the position of the sun, when they decided that the exact point I was concentrating on was going to be their special spot. They politely apologised for inconveniencing me and promised they wouldn't take long (famous last words) and set up their shoot. They filmed their sequence numerous times so it was just as well that I had managed to complete enough of my composition so that I could easily concentrate on another part of the scene. 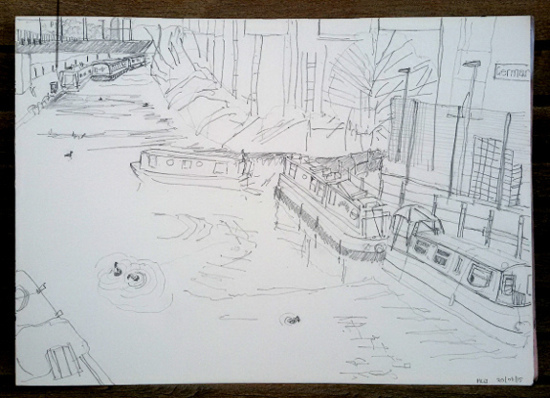 I had initially been standing to the side of the towpath so I wouldn't be in other users way but I was getting a bit tired by this point, and since the film crew didn't mind at all about hogging the space, I decided to sit on my wee sketching stool. This means that half of the drawing was made at one angle and the rest of it at a lower angle. I decided this didn't matter too much and pressed on regardless. Before the film crew had rolled up I had been considering this image as the final one in this series of drawings. But the more I worked on it the more I came to realise that there is at least one more to do before I can call it a day and this will have to wait until I get back from holiday. 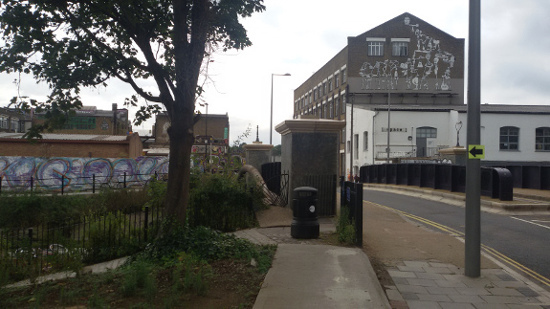 You can see in the distance of this photograph on the left of the bridge stands the White Building on White Post Lane which, although it is dwarfed by larger buildings nearby, is a significant arts venue in the area and they brew their own beer and make great pizzas. The day I chose to make this sketch was very warm and sunny and a plant had bloomed over most of the water thereby changing the colour palette from predominantly grey to an amazing neon green. I found a bench to sit on this time which was more comfortable than my sketching stool and to my left I was entertained by a running conversation between a father and his young son as they discussed how to fix their boat. 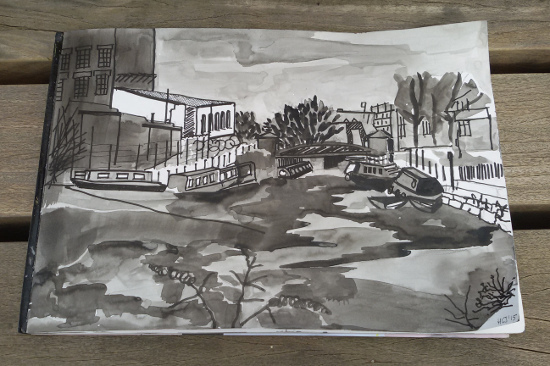 During the spring and summer of 2015 I made a series of black and white sketches along the Hertford Union Canal from Wick Lane to White Post Lane. This area of Hackney Wick is undergoing rapid development and the existing industry that occupies the area is being replaced with blocks of flats and I wanted to make a visual record of the towpath before that happens. I responded to anything that took my fancy and in the autumn I exhibited eight of the sketches (chosen from a total of 21), reproduced as small posters, on the doors of a building owned by the National Grid. 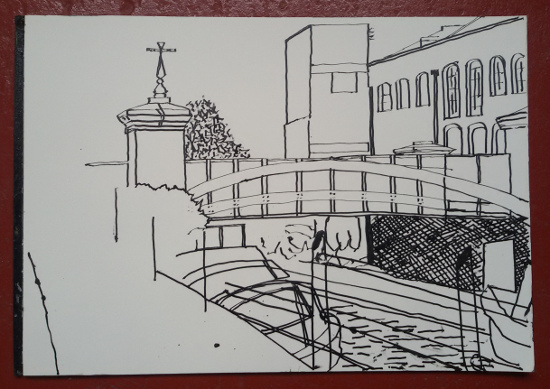 I was keen to exhibit some of this series of drawings in the same setting that they had drawn in for the benefit of the people who use the towpath. Photographs and drawings ©Heather James 2015. Watermark theme. Powered by Blogger.